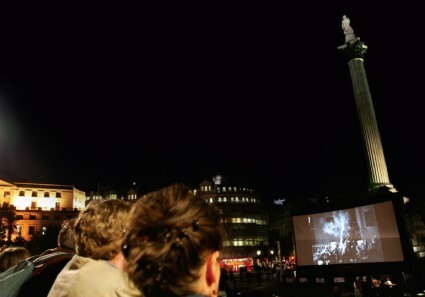 A reminder to anyone in London on 23 or 24 October of the free open-air evening screenings taking place in Trafalgar Square. On the 23rd, starting at 18.30, you can see the British science fiction silent High Treason (1929) – “the British Metropolis” – directed by Maurice Elvey and starring Basil Gill and Benita Hume, with live piano accompaniment by Neil Brand. A fun film to catch, showing a London where we were to be travelling about the city in helicopters, communicating by television, and wearing dodgy fashions. The accompanying short is Gaston Quiribet’s trick film vision of a future London, The Fugitive Futurist (1924). On the 24th, also at 18.30, there’s a programme of fifteen archive films under the title ‘London Loves’. Among the silents in the programme are the bizarre The Smallest Car in the Largest City in the World (1913), a long-time favourite of those at the BFI National Archive, in which a miniature Cadillac drives sedately down London’s streets; news footage of Charlie Chaplin’s return to London in 1921, with esctatic greetings from the crowds; and an evocative travelogue, London’s Contrasts (1924). The star attraction, however, is going to be Living London (1904), Charles Urban’s truly dazzling documentary portrait of London life, a 10-minute epic only recently rediscovered by the National Film and Sound Archive of Australia and shown earlier this month at the Pordenone silent film festival. It returns to London after 104 years, and on the big screen, in that location, the impact should be tremendous. Among the sound films, look out especially for John Krish’s masterpiece of poignant regret, The Elephant Will Never Forget (1953), on the last trams in London – until they bring them back again, of course. Music will be provided by three musicians, names as yet unpublicised. The screenings, organised by Film London and the London Film Festival, follow on from last year’s highly successful showing of Blackmail and a programme of archive shorts. It was a magical experience – not just seeing the films in such an extraordinary yet somehow rightful setting, but for the experience of audience watching. Some settled on the steps of the Square and took in every frame; some stopped by for a while to catch the experience before moving on; some paused briefly, on their way to catch a train, puzzled at what on earth was happening. Neil’s music pounded out, down the streets and over the rooftops, filling the evening air, drawing in people from all around to see what strange activity the capital was up to now. Film was bound up with the life of the city. An experience to savour.